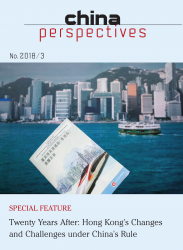 An interdisciplinary quarterly journal, China Perspectives provides insightful analysis of the latest political, economic, social and cultural trends in the Chinese world. China Perspectives is an anonymously peer-reviewed academic journal. Its authority is ensured by an editorial board made up of reputed scholars, and by the expertise of its contributors. It aims to provide a scientific perspective on contemporary issues. A serious yet readable journal, China Perspectives has already proven essential for sinologists and Asia analysts, but its broad scope and highly informative articles may be of interest to anyone keen on improving their knowledge about Greater China. Special feature: Comprehensive and in-depth analysis of one prominent aspect of developments regarding Greater China. A pluridisciplinary approach relying on the latest academic research. Articles: Research articles focusing on specific topics in relation with contemporary China. China analysis: In cooperation with the Asia Centre (Paris), a critical synthesis of recent articles published in the Chinese press and journal. Book reviews: Reviews of the latest significant publications on contemporary China.